Nichrome is an alloy of Nickel and Chromium. 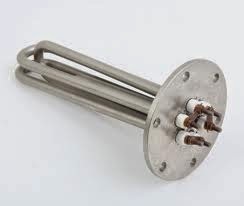 Nicrome is used widely in heating elements. It has a high melting point of 1400 degrees celsius. Nichrome is resistant to oxidation and is stable at high temperatures. When heated, Nichrome forms a layer of Chromium oxide on the surface which prevents further oxidation. Following are some of the physical properties of Nichrome.